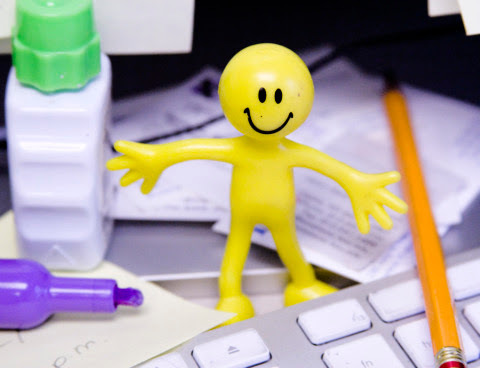 Company OM: Is A Happy Work Environment Really Possible? Let's face it. Work is messy. It will always be messy. It's WORK. Challenges will present themselves. Everything will not happen the way you planned. Everyone will not be on the same page all the time. People will bring personal *hit to work. Someone will unquestionably insult you at some point. Your buttons will be pushed. Gossip and negative talk will happen. So, is it really possible to work in a happy work environment? Happy is a choice. It's how you choose to respond to a situation. It's how aware you are of your own reactions and why you respond that way. It's being mindful of why someone else is responding the way they are. Indeed, toxic work environments exist. But here's the thing... you can choose to respond differently. You can shift how you view a situation. You can smile instead of sneer. You can purposefully send love to the person annoying you rather than any other negative emotion. And when you do, you not only make yourself happier, but you stop a negative chain reaction and start a positive ripple effect. Consider this... Maybe your colleague has pushed your buttons because SHE is feeling insecure. Maybe your client is being difficult because HE just found out his Mom is sick. Maybe the front desk clerk is not being cooperative because she is following a system that has been put in place and does not know how to adapt it. In these cases, we often find ourselves getting angry or judgmental or irritated. The amazing thing about the human mind is that when we notice these feelings, we can shift them. We can choose to see the situation differently. When that car cuts in front of you, and you start to feel ticked off, you can say to yourself, "That guy might be in a hurry to get to his child's school because he is late to pick his child up." Wouldn't you be in a hurry then? Every situation can be perceived in a different way in your mind. And how you react, feel, and respond to every one is YOUR choice. So, yes. Happy work environments are possible. It's how YOU perceive it. It's your choice. And it takes practice to build new pathways in your mind that will help you more automatically respond in a more positive way. Start practicing it now.